Maya Angelou (IPA: /ˈmaɪə ˈændʒəloʊ/), (born Marguerite Johnson, April 4, 1928 – May 28, 2014) was an American poet, memoirist, actress and an important figure in the American Civil Rights Movement. Angelou is known for her series of six autobiographies, starting with I Know Why the Caged Bird Sings, (1969) which was nominated for a National Book Award and called her magnum opus. Her volume of poetry, Just Give Me a Cool Drink of Water 'Fore I Diiie (1971) was nominated for the Pulitzer Prize. Angelou recited her poem, "On the Pulse of Morning" at President Bill Clinton's inauguration in 1993, the first poet to make an inaugural recitation since Robert Frost at John F. Kennedy's inauguration in 1961. She was highly honored for her body of work, including being awarded over 30 honorary degrees. Angelou's first book, I Know Why the Caged Bird Sing, describes her early life and her experience of confronting racism, a central feature of her work. She used the caged bird as a metaphor for the imprisoning nature of racial bigotry on her life. Maya Angelou was born Marguerite Johnson in St. Louis, Missouri, on April 4, 1928 to Bailey Johnson, a doorman and naval dietitian, and Vivian Baxter Johnson, a nurse, real estate agent, and, later, merchant marine. Angelou's brother, Bailey, Jr., gave her the nickname "Maya." Angelou's description of the details of her life in her six autobiographies and in numerous interviews, speeches, and articles, tends to be inconsistent. Her biographer, Mary Jane Lupton, explains that when Angelou speaks about her life, she does so eloquently but informally and "with no time chart in front of her." In 2008, Angelou's family history was profiled on the PBS series African American Lives 2. A DNA test showed that she was descended from the Mende people of West Africa. The program's research showed that Angelou's maternal great-grandmother, Mary Lee, emancipated after the Civil War, cut all ties with her slave past and renamed herself "Kentucky Shannon" because "she liked how it sounded." Little was known about Lee's background because she prohibited anyone from knowing about it. Angelou learned that Lee became pregnant out-of-wedlock by her former owner, a white man named John Savin, and that he forced Lee to sign a false statement accusing another man of being the father. A grand jury indicted Savin for forcing Lee to commit perjury, and despite discovering that Savin was the father, found him not guilty. Lee was sent to the Clinton County, Missouri poorhouse with her daughter, who became Angelou's grandmother, Marguerite Baxter. Angelou's reaction after learning this information was, "That poor little black girl, physically and psychologically bruised." Angelou's first book, I Know Why the Caged Bird Sings, recounts the first 17 years of her life. When Angelou was three and her brother four, their parents' "calamitous marriage" ended, and their father sent them alone by train to live with his mother, Mrs. Annie Henderson, in Stamps, Arkansas. Henderson prospered financially during this time, the years of the Great Depression and World War II, because the general store she owned sold basic commodities and because "she made wise and honest investments." Four years later, the children's father "came to Stamps without warning" and returned them to their mother's care in St. Louis. At age eight, Angelou was sexually abused and raped by her mother's boyfriend, Mr. Freeman. She confessed it to her brother, who told the rest of their family. Mr. Freeman was jailed for one day but was found kicked to death four days after his release. Angelou became mute, believing, as she has stated, "I thought if I spoke, my mouth would just issue out something that would kill people, randomly, so it was better not to talk." She remained nearly mute for five years. Angelou and her brother were sent back to their grandmother once again. Angelou credits a close friend in Stamps, teacher Bertha Flowers, for helping her speak again, as well as introducing her to classic literature by authors such as Charles Dickens, William Shakespeare, Edgar Allan Poe, and James Weldon Johnson. She was introduced to black women artists like Frances Harper, Georgia Douglas Johnson, Anne Spencer, and Jessie Fauset. When Angelou was 13, she and her brother returned to live with her mother in San Francisco, California; during World War II, she attended George Washington High School and studied dance and drama on a scholarship at the California Labor School. Before graduating, she worked as the first black female streetcar conductor in San Francisco. Three weeks after completing school, she gave birth to her son, Clyde, who also became a poet. At the end of Angelou's third autobiography, Singin' and Swingin' and Gettin' Merry Like Christmas, her son announced that he wanted to be called "Guy Johnson" and trained his friends and family to accept it. Angelou's second autobiography, Gather Together in My Name, recounts her life from the age 17 to 19. As feminist Mary Jane Lupton states, this book "depicts a single mother's slide down the social ladder into poverty and crime." In those years, Angelou went through a series of relationships, occupations, and cities as she attempted to raise her son without the benefit of job training or advanced education. As Lupton states, "Nevertheless, she was able to survive through trial and error, while at the same time defining herself in terms of being a black woman." Angelou learned how to perform professionally for live audiences, and exhibited a natural dancing ability and talent. A turning point in this book occurred when a lover seduced her into becoming a prostitute and her son was kidnapped. Angelou won a scholarship to study dance with Trinidadian choreographer Pearl Primus, and married Greek sailor Tosh Angelos in 1952; the marriage ended in divorce one-and-a-half years. Angelou was reluctant to admit how many times she has been married, "for fear of sounding frivolous," although it has been at least three times. Known by "Rita Johnson" up to that point, she changed her name when her managers at The Purple Onion, a San Francisco night club, strongly suggested that she adopt a "more theatrical" name that captured the feel of her Calypso dance performances. She co-created a dance team, "Al and Rita," with choreographer Alvin Ailey, who combined elements of modern dance, ballet, and West African tribal dancing. She toured Europe with a production of the opera Porgy and Bess in 1954–1955, studied modern dance with Martha Graham, danced with Alvin Ailey on television variety shows, and recorded her first record album, Miss Calypso, in 1957. Angelou's third autobiography, Singin' and Swingin' and Gettin' Merry Like Christmas, covered her early dancing and singing career. One of the themes of this book was the conflict she felt between her desire to be a good mother and be a successful performer, a situation "very familiar to mothers with careers." By the end of the 1950s, Angelou moved to New York City, where she acted in off-Broadway productions and met artists and writers active in the Civil Rights Movement. From 1959 to 1960, Angelou held the position of Northern Coordinator for the Southern Christian Leadership Conference at the request of Dr. Martin Luther King, Jr. In the early 1960s, Angelou briefly lived with South African freedom fighter Vusumi Make, and moved with him and her son Guy to Cairo, Egypt, where she became an associate editor at the weekly newspaper The Arab Observer. In 1962, her relationship with Make ended, and she and Guy moved to Ghana. She became an assistant administrator at the University of Ghana's School of Music and Drama, was a feature editor for The African Review, acted, and wrote plays. Angelou became close friends with Malcolm X in Ghana and returned to America in 1964 to help him build a new civil rights organization, the Organization of African American Unity. King was assassinated on her birthday (April 4) in 1968. She did not celebrate her birthday for many years for that reason; she sent flowers to King's widow, Coretta Scott King, every year until King's death in 2006. Inspired by a meeting with her friend James Baldwin, cartoonist Jules Feiffer, and Feiffer's wife Judy, she dealt with her grief by writing her first autobiography, I Know Why the Caged Bird Sings, which brought to her to international recognition and acclaim. In 1973, Angelou married Paul du Feu, an English-born carpenter and remodeler, and moved with him and her son to Sonoma, California. The years to follow were some of Angelou's most productive years as a writer and poet. She composed music for movies, wrote articles, short stories, and poetry for several magazines, continued to write autobiographies, produced plays, lectured at universities all over the country, and served on various committees. She appeared in a supporting role in the television mini-series Roots in 1977, wrote for television, and composed songs for Roberta Flack. Her screenplay, Georgia, Georgia, was the first original script by a black woman to be produced. It was during this time, in the late 1970s, that Angelou met Oprah Winfrey when Winfrey was a TV anchor in Baltimore; Angelou became Winfrey's friend and mentor in 1984. Angelou divorced de Feu and returned to the southern United States in 1981, where she accepted the first lifetime Reynolds Professorship of American Studies at Wake Forest University in Winston-Salem, North Carolina. In 1993, she recited her poem, "On the Pulse of Morning" at President Bill Clinton's inauguration, the first poet to do an inaugural recitation since Robert Frost at John F. Kennedy's inauguration in 1961. In 1993, Angelou's poems were featured in the Janet Jackson/John Singleton film Poetic Justice, in which she also made a brief appearance in the film. In 2006 Angelou became a radio talk show host for the first time, hosting a weekly show for XM Satellite Radio's Oprah & Friends channel. In 2007, she became the first African-American woman and living poet to be featured in the Poetry for Young People series of books from Sterling Publishing. Since the 1990s, Angelou became a busy participant in the lecture circuit. In 1993, she was making about 80 speaking appearances a year. In 1997, over 2000 tickets were sold when she spoke at the Woman's Foundation in San Francisco. Her most common speaking engagements occur on college campuses, "where seating is sold out long before the actual event." When Angelou spoke, she sat on a stool and entertained the audience for approximately one hour, reciting poems by memory and following a flexible outline. By the early 2000s, Angelou traveled to her speaking engagements and book tours stops by tour bus. She "gave up flying, unless it is really vital ... not because she was afraid, but because she was fed up with the hassle of celebrity." In 2002, Angelou lent her name and writings to a line of products from the Hallmark Greeting Card Company. In March 2008, Angelou stated that she planned to spend part of the year studying at the Unity Church. In 2005 she attended a Unity Church service in Miami and decided that day to "go into a kind of religious school and study" on her 80th birthday. 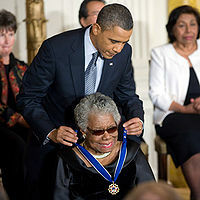 Angelou became involved in US presidential politics in 2008 by placing her public support behind Senator Hillary Clinton for the Democratic Party presidential nominee, in spite of her friend Oprah Winfrey's support of Barack Obama. When Clinton's campaign ended, Angelou put her support behind Senator Barack Obama, who went on to win the election and become the first African American president of the United States. She stated, "We are growing up beyond the idiocies of racism and sexism". In late 2010, Angelou donated her personal papers and career memorabilia to the Schomburg Center for Research in Black Culture in Harlem. Angelou died at her home in Winston-Salem, North Carolina, on the morning of May 28, 2014. She had reportedly been in bad health and had canceled several scheduled appearances. Angelou's use of fiction-writing techniques such as dialogue, characterization, and development of theme, setting, plot, and language often result in the placement of her books into the genre of autobiographical fiction. Angelou characterizes them as autobiographies, not as fiction, but as feminist scholar Maria Lauret stated, Angelou has placed herself in this genre while critiquing it. Angelou also recognizes that there are fictional aspects to her books. 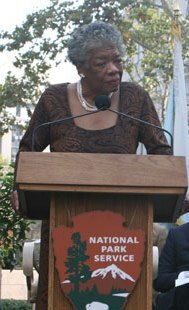 Feminist scholar Mary Jane Lupton states that Angelou tends to "diverge from the conventional notion of autobiography as truth," which parallels the conventions of much of African American autobiography written during the abolitionist period of US history, when the truth was censored out of the need for self-protection. The challenge for much of African-American literature is that its authors have had to confirm its status as literature before it could accomplish its political goals, which is why Robert Loomis, Angelou's editor, was able to dare her into writing Caged Bird by challenging her to write an autobiography that could be considered "high art." When Angelou wrote Caged Bird at the end of the 1960s, one of the necessary and accepted features of literature at the time was "organic unity," and one of her goals was to create a book that satisfied that criteria. Angelou's autobiographies, while distinct in style and narration, are unified in their themes and "stretch over time and place," from Arkansas to Africa and back to the US, occurring in time from the beginnings of World War II to the 1968 assassination of Martin Luther King, Jr. The events in her books are episodic and crafted like a series of short stories, but their arrangements do not follow a strict chronology. Instead, they are placed to emphasize the themes of her books. When I try to describe myself to God I say, "Lord, remember me? Black? Female? Six-foot tall? The writer?" And I almost always get God's attention. Autobiographies written by women in the 1970s have been described as "feminist first-person narratives." Angelou and other feminist writers have used the autobiography to restructure the ways to write about women's lives in a male-dominated society. There is a connection between the autobiographies Angelou has written and fictional first-person narratives; they can be called "fictions of subjectivity" because they employ the narrator as protagonist and "rely upon the illusion of presence in their mode of signification." According to Lauret, "the formation of female cultural identity" is woven into Angelou's narratives, setting her up as "a role model for Black women." Angelou reconstructs the Black woman's image throughout her autobiographies, and uses her many roles, incarnations, and identities to "signify multiple layers of oppression and personal history." Lauret sees Angelou's themes of the individual's strength and ability to overcome throughout Angelou's autobiographies as well. One of the most important themes in Angelou's autobiographies are "kinship concerns," from the character-defining experience of her parents' abandonment to her relationships with her son, husbands, and lovers throughout all of her books. African American literature scholar Dolly McPherson believes that Angelou's concept of family throughout her books must be understood in the light of the way in which she and her older brother were displaced by their parents at the beginning of Caged Bird. Motherhood is a "prevailing theme" in all of Angelou's autobiographies, specifically her experiences as a single mother, a daughter, and a granddaughter. Lupton believes that Angelou's plot construction and character development were influenced by this mother/child motif found in the work of Harlem Renaissance poet Jessie Fauset. Angelou uses the metaphor of a bird struggling to escape its cage described in Paul Laurence Dunbar's poem as a "central image" throughout her series of autobiographies. Like elements within the prison narrative, the caged bird represents Angelou's imprisonment from the racism inherent in Stamps, Arkansas, and her continuing experiences of other forms of imprisonment, like racial discrimination, drug use, marriage, and the economic system. This metaphor also invokes the "supposed contradiction of the bird singing in the midst of its struggle." French writer Valérie Baisnée put Angelou's autobiographies in the midst of literature written during and about the American Civil Rights movement. Critic Pierre A. Walker characterized Angelou's book as political. He emphasized that the unity of her autobiographies serves to underscore one of Angelou's central themes: the injustice of racism and how to fight it. Walker also stated that Angelou's biographies, beginning with Caged Bird, consists of "a sequence of lessons about resisting racist oppression." This sequence leads Angelou, as the protagonist, from "helpless rage and indignation to forms of subtle resistance, and finally to outright and active protest" throughout all six of her autobiographies. Angelou has used the same editor throughout her writing career, Robert Loomis, an executive editor at Random House, who has been called "one of publishing's hall of fame editors." She has used the same "writing ritual" for many years. She gets up at five in the morning and checks into a hotel room, where the staff has been instructed to remove any pictures from the walls. She writes on legal pads while lying on the bed, with only a bottle of sherry, a deck of cards to play solitaire, Roget's Thesaurus, and the Bible, and leaves by the early afternoon. She averages 10-12 pages of material a day, which she edits down to three or four pages in the evening. At the time of her death, tributes to Angelou and condolences were paid by artists, entertainers, and world leaders, including President Barack Obama, whose sister had been named after Angelou, and former President Bill Clinton. Harold Augenbraum, from the National Book Foundation, said that Angelou's "legacy is one that all writers and readers across the world can admire and aspire to." Angelou has been honored by universities, literary organizations, government agencies, and special interest groups. Her honors include a National Book Award nomination for I Know Why the Caged Bird Sings, a Pulitzer Prize nomination for her book of poetry, Just Give Me A Cool Drink of Water 'Fore I Die, a Tony Award nomination for her role in the 1973 play Look Away, and three Grammys for her spoken word albums. In 1995, Angelou's publishing company, Bantam Books, recognized her for having the longest-running record (two years) on The New York Times Paperback Nonfiction Bestseller List. She has served on two presidential committees, and was awarded the Presidential Medal of Arts in 2000 and the Lincoln Medal in 2008. Musician Ben Harper has honored Angelou with his song "I'll Rise," which includes words from her poem, "And Still I Rise." She has been awarded over 30 honorary degrees. In 2011, President Barack Obama awarded her with the Medal of Freedom, the country's highest civilian honor. I Know Why the Caged Bird Sings, 1969. Gather Together in My Name, 1974. Singin' and Swingin' and Gettin' Merry Like Christmas, 1976. The Heart of a Woman, 1981. All God's Children Need Traveling Shoes, 1986. A Song Flung Up To Heaven, 2002. The Collected Autobiographies of Maya Angelou, 2004. Just Give Me a Cool Drink of Water 'Fore I Diiie, 1971. Oh Pray My Wings are Gonna Fit Me Well, 1975. And Still I Rise, 1978. Shaker, Why Don't You Sing, 1983. Now Sheba Sings the Song, 1987. I Shall Not Be Moved, 1990. "On the Pulse of Morning," 1993. The Complete Collected Poems of Maya Angelou, 1994. Phenomenal Woman: Four Poems for Women, 1995. "A Brave and Startling Truth," 1995. "From a Black Woman to a Black Man," 1995. "Mother, a Cradle to Hold Me," 2006. Poetry for Young People, 2007. Wouldn't Take Nothing for My Journey Now, 1993. Even the Stars Look Lonesome, 1997. Hallelujah! The Welcome Table, 2004. Mother: A Cradle to Hold Me, 2006. Mrs. Flowers: A Moment of Friendship (selection from I Know Why the Caged Bird Sings), illustrated by Etienne Delessert, 1986. Life Doesn't Frighten Me (poem), edited by Sara Jane Boyers, illustrated by Jean-Michel Basquiat, 1993. Soul Looks Back in Wonder (with others), illustrated by Tom Feelings, 1993. My Painted House, My Friendly Chicken and Me, photographs by Margaret Courtney-Clarke, 1994. Kofi and His Magic, photographs by Margaret Courtney-Clarke, 1996. Maya's World series, illustrated by Lizzy Rockwell, 2004. Cabaret for Freedom (musical revue), with Godfrey Cambridge, produced at Village Gate Theatre, New York, 1960. The Least of These (two-act drama), produced in Los Angeles, 1966. The Best of These (drama), 1966. The Clawing Within (two-act drama), 1966. Sophocles, Ajax (two-act drama), produced at Mark Taper Forum, Los Angeles, 1974. And Still I Rise (one-act musical), produced in Oakland, Calif., 1976. Theatrical Vignette (one-act play), 1983. King, (lyrics, with Alistair Beaton) book by Lonne Elder III, music by Richard Blackford, produced in London, 1990. Poetic Justice (author of poems), 1993. The Black Candle (author of poems), 2008. Black, Blues, Black (series of ten one-hour PBS programs), 1968. Assignment America (series of six one-half-hour PBS programs), 1975. I Know Why the Caged Bird Sings, 1979. Maya Angelou's America: A Journey of the Heart (also host), 1988. Down in the Delta, 1998. Moon on a Rainbow Shawl, 1988. Cabaret for Freedom (also produced), 1960. There Are No Children Here, 1993. How to Make an American Quilt, 1995. The Black Candle (narrator), 2008. Touched By An Angel, 1995. Down in the Delta, 1999. Talk Host, Oprah and Friends, XM Satellite Radio, launched 2006. For the Love of Ivy, 1968. The Poetry of Maya Angelou, 1969. An Evening with Maya Angelou, 1975. I Know Why the Caged Bird Sings (with filmstrip and teacher's guide), 1978. Making Magic in the World, 1988. On the Pulse of Morning, 1993. ↑ Kate Kellaway, Poet for the new America The Guardian, January 23, 1993. Retrieved May 28, 2014. ↑ Mary Jane Lupton, Maya Angelou: A critical companion (Westport, CT: Greenwood Press, 1998, ISBN 0313303258), 2. ↑ Henry L. Gates, Jr. (host), African American lives 2: The past is another country (Part 4). PBS.org, 2008. Retrieved March 15, 2008. ↑ Henry L. Gates, Jr. (host),African American lives 2: A way out of no way (Part 2). PBS.org, 2008. Retrieved March 15, 2008. ↑ Maya Angelou, I Know Why the Caged Bird Sings. (New York: Random House, 1969, ISBN 0375507892), 6. ↑ 6.0 6.1 Lupton, 4. ↑ Sarah Healy, Maya Angelou Speaks to 2,000 at Arlington Theater. Daily Nexus, February 21, 2001. Retrieved May 28, 2014. ↑ 9.0 9.1 Lupton, 15. ↑ 10.0 10.1 10.2 10.3 Maya Angelou. Poetry Foundation. Retrieved May 28, 2014. ↑ 11.0 11.1 11.2 Richard Long, 35 who made a difference: Maya Angelou. Smithsonian.com, November 1, 2005. Retrieved May 28, 2014. ↑ 12.0 12.1 Lupton, 6. ↑ 14.0 14.1 Gary Younge, No surrender. The Guardian, May 25, 2002. Retrieved May 28, 2014. ↑ Kira Rose, At B-School reunion, it's Maya Angelou, not a CEO. The Michigan Daily, October 7, 2007. Retrieved April 5, 2009. ↑ Lawrence Van Gelder, Winfrey's Gift The New York Times, April 8, 1998. Retrieved May 28, 2014. ↑ Dinitia Smith, A career in letters, 50 years and counting. The New York Times, January 23, 2007. Retrieved October 23, 2007. ↑ African Overseas Union, Maya Angelou: A brief biography. Retrieved May 28, 2014. ↑ Oprah Winfrey, Oprah's cut with Maya Angelou. Oprah.com. Retrieved October 2, 2007. ↑ Catherine S. Manegold, "An afternoon with Maya Angelou; A wordsmith at her inaugural anvil." New York Times, January 20, 1993. Retrieved May 28, 2014. ↑ Vincent Canby, Review/Film: Poetic Justice; On the road to redemption. New York Times, July 23, 1993. Retrieved May 28, 2014. ↑ Maya Angelou still rises. CBS News, October 22, 2007. Retrieved May 28, 2014. ↑ Maria Lauret, Liberating literature: Feminist fiction in America (New York: Routledge, 1994, ISBN 0415065151), 26. ↑ Jeannie Williams, Maya Angelou pens her sentiments for Hallmark USA Today, January 10, 2002. Retrieved May 28, 2014. ↑ Hillel Italie, Maya Angelou at 80: Life is still an adventure. Associated Press, March 29, 2008. Retrieved April 5, 2009. ↑ 29.0 29.1 Bob Minzesheimer, Maya Angelou celebrates her 80 years of pain and joy USA Today, March 26, 2008. Retrieved May 28, 2014. ↑ Jennifer Parker, From King's 'I Have a Dream' to Obama Inauguration ABC News, January 19, 2009. Retrieved May 29, 2014. ↑ Clarence Waldron, Maya Angelou Donates Private Collection to Schomburg Center in Harlem Jet Magazine, November 11, 2010. Retrieved May 29, 2014. ↑ 33.0 33.1 33.2 Lauret, 98. ↑ 34.0 34.1 Lupton, 34. ↑ 36.0 36.1 Lupton, 1. ↑ Lynn Neary, At 80, Maya Angelou reflects on a 'glorious' life. NPR, April 6, 2008. Retrieved May 28, 2014. ↑ Dolly A. McPherson, Order out of chaos: The autobiographical works of Maya Angelou (New York: Peter Lang Publishing, 1990, ISBN 0820411396), 14. ↑ Valérie Baisnée, Gendered resistance: The autobiographies of Simone de Beauvoir, Maya Angelou, Janet Frame and Marguerite Duras (Amsterdam: Rodopi, 1994, ISBN 9042001097), 62. ↑ 45.0 45.1 45.2 Pierre A. Walker, "Racial protest, identity, words, and form in Maya Angelou's I Know Why the Caged Bird Sings." College Literature 22 (3)(October 1995): 91-108. Retrieved May 28, 2014. ↑ Martin Arnold, Making books; Familiarity breeds content New York Times Books, April 12, 2001. Retrieved May 28, 2014. ↑ Alexandra Alter, Author, Poet Maya Angelou Dies The Wall Street Journal, May 28, 2014. Retrieved May 29, 2014. ↑ Maya Angelou 'the brightest light' says Barack Obama BBC News, May 28, 2014. Retrieved May 29, 2014. ↑ Colleen Jenkins and Bill Trott, U.S. author, poet Maya Angelou dies at 86 Reuters, May 28, 2014. Retrieved May 29, 2014. ↑ Homer E. Moyer, The R.A.T. Real-world aptitude test: Preparing yourself for leaving home (Sterling, VA: Capital Books, 2003, ISBN 1931868425), 297. ↑ Official Website of the Tony Awards Past Winners.. Retrieved October 5, 2007. ↑ Maya Angelou Official Website Biography Information. Retrieved October 24, 2007. ↑ John T. Woolley and Gerhard Peters, National Commission on the observance of International Women's Year, 1975 appointment of members and presiding officer of the commission. The American Presidency Project, March 28, 1977. Retrieved October 6, 2007. ↑ Sculptor, painter among National Medal of Arts winners CNN.com, December 20, 2000. Retrieved October 12, 2007. ↑ Natasha T. Metzler, Stars perform for president at Ford's Theatre gala Associated Press, June 1, 2008. Retrieved June 11, 2008. ↑ Lucinda Moore, Growing Up Maya Angelou. Smithsonian.com, April 1, 2003. Retrieved May 28, 2014. ↑ Faith Karimi, Legendary author Maya Angelou dies at age 86 CNN, May 28, 2014. Retrieved May 28, 2014. ↑ Maya Angelou, Maya Angelou's On the Pulse of Morning. Electronic Text Center, University of Virginia Library. Retrieved May 28, 2014. ↑ Dana Kennedy, Holiday Films; A Poet, at 70, ventures into the unknown. The New York Times, November 15, 1998. Retrieved May 28, 2014. ↑ Muppet Wiki Maya Angelou. Retrieved May 28, 2014. Angelou, Maya. I Know Why the Caged Bird Sings. New York: Random House, 1969. ISBN 0375507892. Angelou, Maya Wouldn't Take Nothing for My Journey Now. New York: Random House, 1993. ISBN 0394223632. Baisnée, Valérie. Gendered resistance: The autobiographies of Simone de Beauvoir, Maya Angelou, Janet Frame and Marguerite Duras. Amsterdam: Rodopi, 1994. ISBN 9042001097. Elliot, Jeffrey M. Conversations with Maya Angelou. Jackson, MI: University Press, ISBN 087805362X. Lauret, Maria. Liberating literature: Feminist fiction in America. New York: Routledge, 1994. ISBN 0415065151. Lupton, Mary Jane. Maya Angelou: A critical companion. Westport, CT: Greenwood Press, 1998. ISBN 0313303258. McPherson, Dolly A. Order out of chaos: The autobiographical works of Maya Angelou. New York: Peter Lang Publishing, 1990. ISBN 0820411396. Moyer, Homer E. The R.A.T. real-world aptitude test: Preparing yourself for leaving home. Sterling, VA: Capital Books, 2003. ISBN 1931868425. Sartwell, Crispin. Act like you know: African-American autobiography and white identity. Chicago: University of Chicago Press, 1998. ISBN 0226735273. This page was last modified on 7 September 2018, at 18:49.